A quill pen is made from the primary flight feather of a large bird. Common quills are made from discarded left-wing feathers of geese or swan; other birds that have good quill feathers are turkeys, crows, hawks, eagles and owls. These birds lose more left-wing feathers during the molt process. The large, hollow shafts of these feathers act like reservoirs for ink. The tip of a quill is cut, split and hardened before use. A fountain pen is a nib pen that uses the same type of capillary action as a quill, and it contains an internal reservoir that holds ink until it is used. Select a quill pen that is designed for beginners. It will have a sharpened tip, but the tip will not be split. Instead, small grooves will direct the ink from the reservoir in the quill to the tip. This will give a beginner better ink control. Place good-quality calligraphy paper on the writing table. If you are new to this type of writing, you might want to select a paper with guide marks to assist you in shaping your letters. Dip your quill into the ink pot. The ink should be a calligraphy ink, not India ink. India ink has adhesive properties that do not make it optimum for quill writing. Begin writing in cursive style. Keep in mind that a quill will not turn or roll easily and that portions of your letters will be wider as a natural course. Write so your letters are open in form, for less risk of ink globs. It is best to allow your writing to air-dry before touching it. Refill a fountain pen in one of three ways. You can dip a converter into ink and fill from the screw-type top of the converter. With bladder-type pens, press down on the nib while it is resting in ink, and use the tiny bar like a siphon to draw ink into the bladder; when the bladder is full, insert it into the barrel of the pen. With cartridge-type pens, simply remove the empty cartridge, then replace it with a full cartridge. Clean the nib of your pen well before each use, since any dirt can glob up your ink. Make sure you use fountain pen ink, as other types of ink could ruin your pen. Test your pen by pressing the nib until ink flows. Write on your stationery paper so your hand does not cross over your fresh ink. Many nibs and effects are possible, and fountain pens often can create calligraphy-style writing. Fountain pens are still available. 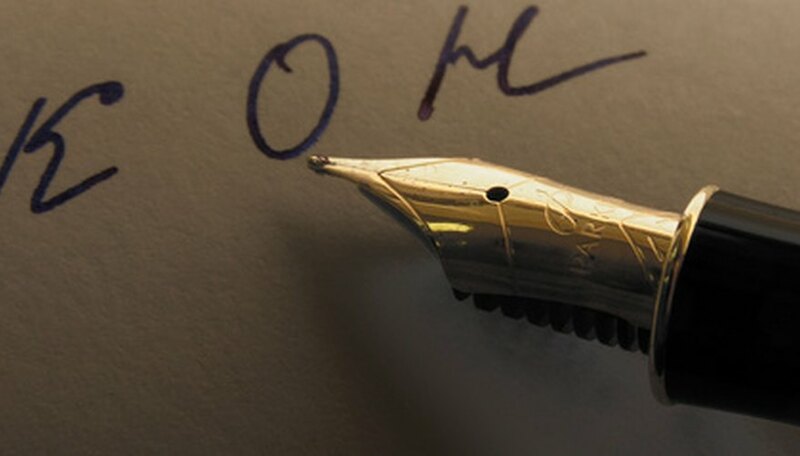 Writing made by a fountain pen has a distinct appearance that is much favored by people who like to write letters and other documents by hand.